For 50 years, the Myra Kraft Transitional Year Program has helped students tap their potential and become who they're meant to be. The Myra Kraft Transitional Year Program, a one-of-a-kind academic program that stands as a pillar of Brandeis’ commitment to social justice, is marking a milestone anniversary this academic year, celebrating a half century of changing lives. 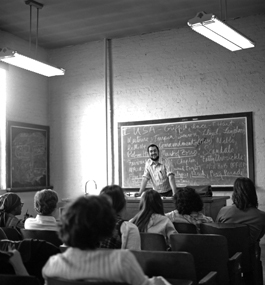 Launched in fall 1968, MKTYP, then known as the Transitional Year Program, prepares talented students from under-resourced high schools for a competitive college-level liberal arts curriculum through a combination of small classes, rigorous academics and strong academic support. Over the years, the program has graduated more than 1,000 alumni, who are now judges, lawyers, doctors, teachers and others in service to their communities. “We are a program of people with amazing stories who add greatly to the university — stories of triumph, and resilience, and talent,” says Kathryn Bethea, now in her third year as the program’s director. Most years, approximately 20 students participate in the program. If students complete the yearlong program successfully, they are promised admission to Brandeis. Currently, 68 program alumni are Brandeis students. Bethea, who holds a PhD in higher-education management from the University of Pittsburgh, says, “When I saw the MKTYP director job description, I realized it was doing everything I want to do and promote, because many times when you’re thinking about college access, you forget the other piece is retention. The Transitional Year Program began under the leadership of Jacob “Jerry” Cohen, an American studies professor who retired in 2017 after more than 50 years at Brandeis. 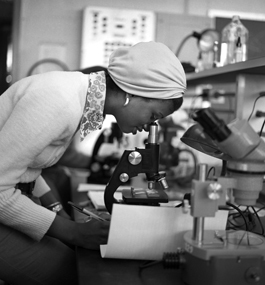 In the 1960s, following an extended sabbatical working with the Congress of Racial Equality, Cohen and a friend convinced the Carnegie Corporation to help fund a program that would bring so-called disadvantaged students to campuses during the summer months to prepare them for attending college. That pilot program became the inspiration for Upward Bound, part of President Lyndon Johnson’s War on Poverty. Brandeis participated in the program, with Cohen as director, in the mid-’60s. But Cohen was soon frustrated by the limitations of the Upward Bound model. Eight weeks during the summer just wasn’t long enough for students to make “the very daunting transition into the demands of college,” he says. He began envisioning a program that lasted a full academic year, which would allow students to live on campus, take the program’s courses as well as Brandeis courses, and live among Brandeis students. True to the revolutionary spirit on U.S. campuses then, the first TYP students were among those participating in a walkout that disrupted fall-semester classes, and they were part of the group who took over Ford Hall for a week in January 1969. 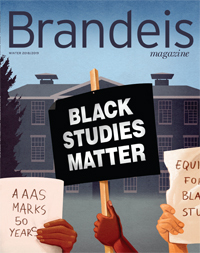 Ford Hall protest demands included the creation of an African and African-American studies department at Brandeis and the replacement of Cohen with a black TYP director. Both demands were accepted; Cohen stepped down after the school year was over. TYP students continued to take the program’s activist roots to heart. In spring 1975, a group of students took over Pearlman Hall to protest budget cuts, including a 50 percent reduction of the TYP budget. Forty years later, during the Black Lives Matter protests that unfurled across the U.S., a sit-in known as #FordHall2015 was organized at Brandeis. MKTYP students Erika Carter and Christian Nuñez, two Rhode Island natives who are both ’19, were participants. “I wanted the chance to be a leader and to have the voice I learned I would have in a space meant to work toward issues of social justice,” Carter says. TEAMWORK: Robert Kraft, owner of the New England Patriots, with a group of MKTYP scholars at Gillette Stadium in September. Nuñez learned about Brandeis and MKTYP from his high-school guidance counselor. “I went to high school on the south side of Providence, where there was a lot of violence and gang-related activity,” he says. He’s grateful Brandeis has given him a chance to develop intellectually “for the journey to come,” in subject areas as wide-ranging as genetic engineering and American military history. Boston native Napoleon Lherisson ’11, another program alum, praises the dedicated staff who make MKTYP a success. The mentorship he received, he says, was invaluable in introducing him to the academic and social-justice experience on campus. Today, Lherisson is an educator and diversity coordinator at an independent school in Cary, North Carolina. The program’s impact continues through his work. “I’m in the business of transforming lives up to this day,” he says. Fifty years on, MKTYP’s most profound legacy is in its longevity and reach. “Brandeis became a leader of efforts of this kind within the American university system,” Cohen says. And although other schools established similar programs around the time of TYP’s founding, “no other American college or university continued its program except one, and that’s Brandeis. Stephen Silver is a journalist and film critic who lives outside Philadelphia.